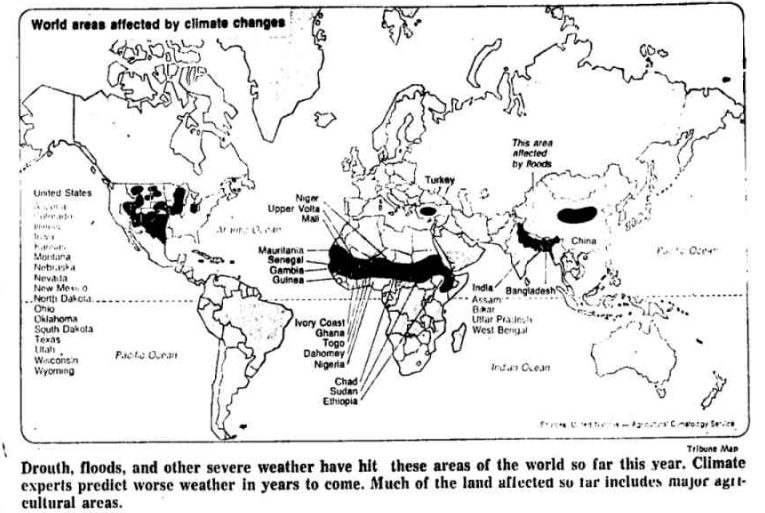 Climate experts tell us that there never was a 1970’s global cooling panic. 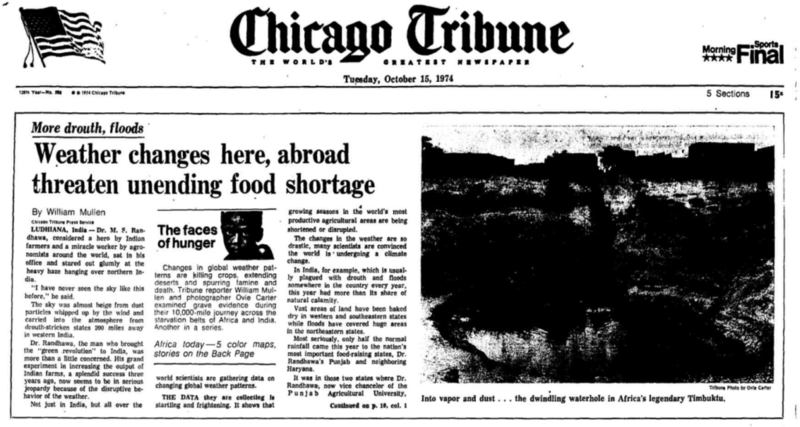 This was the lead story in the Chicago Tribune on October 15, 1974. Climatologists around the world reported a 2.7 degree drop in temperature (since erased by NOAA and NASA) an expansion of the Polar Vortex (now blamed on global warming instead of global cooling) and an expanding Arctic ice cap (since erased by NSIDC.) They said that this global cooling would kill half a billion people by the end of the century. all over the world scientists are gathering data on changing global weather patterns. THE DATA they are collecting Is startling and frightening. It shows that growing seasons in the world s most productive agricultural areas are being shortened or disrupted. The changes in the weather are so drastic, many scientists are convinced the world is undergoing a climate change. climatologists around the world have come to the same conclusions …. They have detected a significant expansion of high-altitude polar winds that move above the North and South Poles, controlling the prevailing wind patterns over the rest of the world. They theorize that the expanded polar wind activity has changed the patterns of equatorial winds that normally bring monsoon rains to Africa, to India, and to Latin America. At the same time, the polar ice caps have been growing, and the climatologists think are may be moving into a period of shorter growing seasons and shrinking crop zones, particularly in Canada and the U. S.
ASIDE FROM shifting pattern (of monsoon rains and the lengthening winters in the northern hemisphere. one of the most ominous fluctuations is the drop in the mean global atmospheric temperature by 2.7 degrees since the late 1940s. By the late ’80s or early ’90s “Global Cooling” had morphed into “Nucear Winter”and I’m quite sure I remember those stories along with “Global Warming” stories running at the same time in our wonderful main stream press. So right at the beginning I knew something was wrong. The earth IS cooling of course. Try growing a vineyard where the Romans did in Britain or farming where the Vikings did in Greenland. The actually climate cooling is too slow to be noticed by observation over a typical human lifespan but will inevitably lead to the next glacial stage of this ice age. Since most of the shorter term cycles have now entered their cold phases it is time for the alarmists to switch to “instant ice age” hype again, but they appear to be locked into their Globull Warming hype, despite renaming it to Climate Change. Indications are that the oncoming colder period is likely to be significantly more severe than that of the ’70s, perhaps enough to reduce crop harvests within a decade or two. If those indicators are correct, it will be interesting to watch alarmists try (or not) to change their tune. Britain has a flourishing wine industry and their vineyards extend further north than the Romans were able to manage. Jim-Bob, keep in mind of today’s Agricultural technologies, growers have far more at their expense today then 2000 years ago! I think you have a point, and I’ll have to stop using that. Nonetheless, many of today’s British vineyards are nothing like Roman ones with their shops, visitor’s centers, tours, restaurants, and hotels etc. Could they make it on the wine alone? In the north? With heritage Roman varieties? Without modern methods? The real climate deniers (the alarmists) now try to deny that the 1970’s cooling scare ever happened. Unfortunately for them, they have not been able to destroy every old newspaper. I feel certain that they would if they could. I notice that the story carefully avoids any suggestion that the governments of the countries concerned might be part of the problem. Just more lies from the fraudsters. @SteveCase The phrase nuclear winter was coined by anti-nuke freaks who predicted a catastrophic planetary devastation unleashed by inevitable global thermonuclear war because Reagan was certain to start that war with Gorbachev. Unsurprisingly, the ecological results of nuclear winter seem to parallel the effects of unbridled global warming, as supposed by “an inconvenient truth” and “day after tomorrow”. Environmental activists have no creativity or imagination in their bleary vision of the future. If this new “Cycle” gets ugly then “We” ALL will find out what it means to live at the “wrong” time ! Everything will “change”, EVERYTHING !! Man, everyone hope and pray that this doesn’t happen and remember this, if this Cycle turns ugly (COLD, REALLY COLD), those/these pathological liars lead Us there, that is when these pagans tempted the All-Mighty and brought His rath upon Us !! !